This essay appeared in the March 1-3, 2012 edition of Counterpunch at this link. A shorter, earlier version of this essay appeared on the Time.com at this link. Most Americans do not realize the extent to which the U.S. is becoming involved militarily in the welter of conflicts throughout Saharan and sub-Saharan Africa (check out the chaos as mapped here). Although recent reports have tended to focus on the French effort to kick Al Qaeda in Islamic Maghreb (AQIM) out of Mali — an effort that may now be devolving into a far more complex guerrilla war, that French operation is just one operation in what may be shaping up to be a 21st Century version of the 19th Century Scramble for the resources of Africa. It’s a policy that, from the U.S. point of view, may not be unrelated to the pivot to China, given China‘s growing market and aid presence in Africa. Together, the scramble and the pivot will be sufficient to offset the near term effect of an sequester in the Pentagon with a torrent of money flows in the future. Last year, Craig Whitlock of the Washington Post provided a mosaic of glimpses into the widespread U.S. involvement in Africa. He authored a series of excellent reports, including here, here and here. The map below is my rendering of the basing information in Whitlock’s report (and others), as well as the relationship between that basing information to distribution of Muslim populations in central Africa. Consider the distances involved in this swath of bases loosely portrayed by the red dots: the distance between these bases along the axis from northwest to southwest on the African continent alone is greater that the distance from New York to Los Angeles. Think of the ethnic and tribal differences between Burkina Faso and Kenya, not to mention the differences within those countries! And remember, virtually all of North Africa, from Morocco to Egypt is over 90% Muslim. 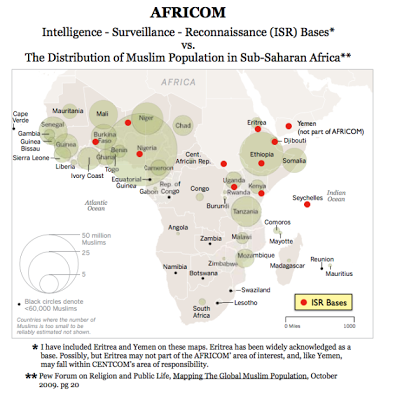 `While the correlation between Muslim populations and our intervention activities in this variety of cultural mosaics will suggest a welter of differing messages to different audiences, one generalization is certain, given our recent history of intervention: Africom's continuing presence and involvement will further inflame our relationship with militant Islam and perhaps the far larger number of moderate Muslims. But think of the other possibilities for one's imagination to run wild. For example: In view of the recent Libyan adventure, conspiratorially-minded North African Islamic radicals (and moderates?) with a penchant for seeing visions in cloud formations may well interpret the swath of Africom's bases structure in Sub-Saharan Africa as early bricks in the construction an anvil, against which, they will be smashed by a new generation of European neocolonialists, attacking from the north in obedience with the new "leading from behind" doctrine of President Obama. Of course, given the distances involved and the porosity those distances imply, such divagations of the paranoid mind are silly from a military point of view. But given the US's murderous track record of lies in Iraq, incompetence in Afghanistan, and our blatant disregard for the Palestinians by constructing a peace processes that facilitated the growth of settlements in a thirty-year land grab by Israel, that kind of characterization nevertheless will be grist for the propaganda mill as well as the fulminations of a paranoid mind. And remember, just because you are paranoid doesn't mean someone isn't out to get you. Another sense of the metastasizing nature of our involvement in Africa can be teased out of the leaden, terrorist-centric, albeit carefully-constructed verbiage in the prepared answers submitted by Army General David M. Rodriguez to Senate Armed Services Committee in support of his 13 February 2013 confirmation to be the new commander of the U. S. Africa Command or Africom. I urge readers to at least skim this very revealing document. The terrorist “threats” in sub-Saharan Africa that are evidently so tempting to the neo-imperialists at Africom do not exist in isolation. They are intimately connected to the ethnic/tribal discontent in Africa, a subject alluded to but not really analyzed by Rodriquez or his senatorial questioners in their carefully choreographed Q&A. The hostage crisis at the gas plant in eastern Algeria last January illustrates some of the deeply-rooted cultural complexities at the heart of many of these conflicts. Akbar Ahmed recently argued this point in one of his fascinating series of essays published by Aljazeera. This series, which I believe is very important, is based on his forthcoming book, The Thistle and the Drone: How America’s War on Terror Became a War on Tribal Islam, to be published in March by Brookings Institution Press. Ambassador Akbar Ahmed is the former Pakistani high commissioner to the UK, and he now holds the the appropriately named Ibn Khaldun Chair of Islamic Studies at American University in Washington, D.C. Considered to be one of fathers of modern historiography and the social sciences, Ibn Khaldun is also one of history's most influential scholars of spontaneous nature of tribalism and its role in establishing social cohesion. The central thrust of Professor Ahmed's work is in that spirit. He aims to explain why discontent is so widespread throughout the former colonial world and how it is partially rooted in a complex history of oppressions of ethnic groups and in tribal rivalries throughout the region. This has created a welter of tensions between the weak central governments of the ex-colonial countries and their peripheral minority groups and tribes. Ahmed argues that these tensions have been exacerbated by our militaristic response to 9/11. He explains why military interventions by the U.S. and former European colonial powers will worsen the growing tension between central governments and these oppressed groups. Among other things, Ahmed, perhaps inadvertently, has laid out a devastating critique of US failure to abide by the criteria of a sensible grand strategy in its reaction to 9/11. By confusing a horrendous crime with an act of war, declaring an open ended global war on terror, and then conducting that war according to a classically flawed grand strategy that assumed “You are either with us or against us,” the US has not only created enemies faster than it can kill them, but in so doing, it has mindlessly exacerbated highly-volatile, incredibly-complex, deeply-rooted local conflicts and thereby helped to destabilize huge swathes of Asia and Africa. Mindless? Consider please the following: Most readers of this essay will have heard of AQIM and probably the the Tuaregs as well. But how many of you have heard of the Kabyle Berbers and their history in Algeria? (I had not.) Yet according to Professor Ahmed, a Kabyle Berber founded AQIM, and that founding is deeply-rooted in their historical grievances. So, there is more to AQIM than that of simply being an al Qaeda copycat. You will not learn about any of this from Rodriquez’s answers, notwithstanding his repeated references to AQIM and Algeria; nor will you learn anything about this issue from the senators’ questions. You can prove this to yourself. Do a word search of General Rodriquez’s Q&A package for any hint of an appreciation of the kind of complex history described by Ahmed in his Aljazeera essay, The Kabyle Berbers, AQIM, and the search for peace in Algeria. (You could try using search words like these, for example: AQIM, Kabyle, Berber, history, Tuareg, tribe, tribal conflict, culture, etc — or use your imagination). In addition to noting what is not discussed, note also how Rodriquez’s threat-centric context surrounding the words always pops up. Compare the sterility his construction to the richness of Ahmed’s analysis, and draw your own conclusions. 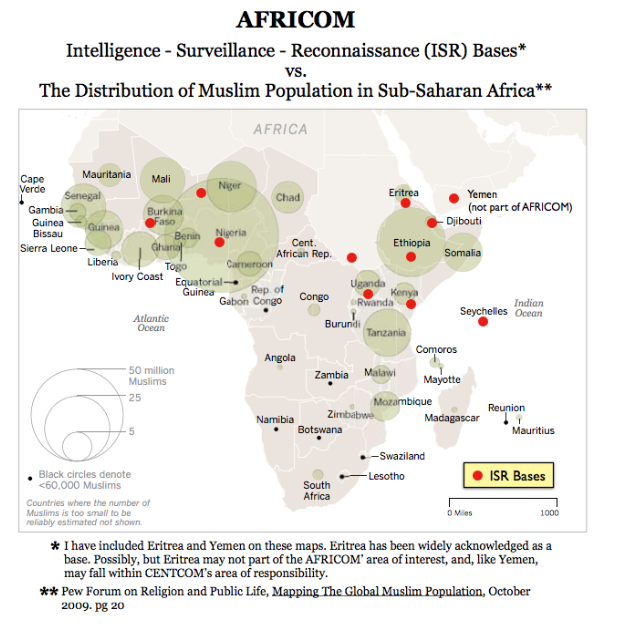 Bear in mind AQIM is just one entry in Africom’s threat portfolio. What do we not know about the other entries? As Robert Asprey showed in his classic 2000 year history of guerrilla wars, War in the Shadows, the most common error made by outside interveners in a guerrilla war is succumbing to the temptation to allow their “arrogance of ignorance” to shape their military and political efforts. Notwithstanding the arrogance of ignorance being reaffirmed in Vietnam, Afghanistan, Iraq, and Libya, it is beginning to look like Asprey’s timeless conclusion will be reaffirmed Africa.